DIY home improvement projects are more popular than ever! The proliferation of big-box home improvement stores and even online DIY superstores is thanks to the popularity of this trend. But DIY kitchens tend to be challenging. Obviously you can’t make your own refrigerator, stove, dishwasher, or sink. You could make your own cabinets, if you have a well-equipped wood shop and are closer to a professional cabinetmaker or carpenter than a typical do-it-yourselfer, but, realistically, building your own kitchen cabinets is way beyond the scope of the usual DIY project. 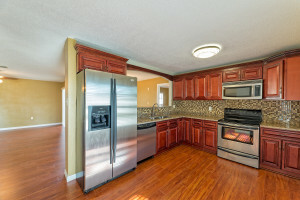 RTA kitchen cabinets are the solution! The way we see it, there are two goals of DIY home improvement. One is to save money compared to hiring the same project done—check. RTA kitchen cabinets cost a fraction of the same high-quality cabinets at one of those big box stores we mentioned before. This is for two reasons. First, you’re not paying to ship around a bunch of air! RTA cabinets come densely packed in flat boxes that are far easier (and cheaper) for shipping carriers to handle and deliver, saving you hundreds or even thousands of dollars. Second, you’re not paying some factory worker somewhere to do the assembly, saving you yet thousands more! Frankly, assembly is the part most DIYers can totally handle. You don’t need any special equipment—no belt sanders, table saws, temperature and humidity-controlled paint booths—just a screwdriver, some wood glue (optional) and maybe a drill, things even a first-time DIYer will have. You’ve seen it on TV commercials. If this isn’t your first project, you’ve felt it yourself. That feeling of chest-swelling, hands-on-hips pride as you look over what you’ve done, the additions and improvements to your home that you built with your own two hands. Don’t get us wrong; building a kitchen with RTA cabinets is a big project. It’s no joke. The sheer number of boxes that’ll arrive can be overwhelming, and it will probably take you a pretty solid weekend of work to knock out, between assembling and hanging the cabinets. But with that challenge comes the feeling of satisfaction and pride. It’s a feeling that doesn’t fade, not completely. For years and years to come, when you look at your beautiful new kitchen, you’ll be able to say to yourself or to guests, “I did that.” Doesn’t that sound right? Yeah, it does. So get started today! The first step is to design your new kitchen, and build the list of materials you’ll need to make it real, and lucky for you, we’ve got you covered! Our DIY Kitchen Design Tool is a FREE online tool that meshes seamlessly with our RTA kitchen cabinet lines. With an easy-to-use drag-and-drop interface, you can try different layouts way more easily than with graph paper and rulers, and when you’re done, you can export the whole design right into your shopping cart, to make ordering a breeze! Get Your Dream Kitchen Designed for FREE! The staff at RTACabinetStore.com will provide you with a FREE, no obligation professional kitchen design consultation with one of our expertly trained designers (a $500 value). When you sign up, you'll also receive information about our free Kitchen Design Tool! It's the easiest way to design your dream kitchen. Copyright ©2019 RTA Cabinet Store, LLC wholesale ready-to-assemble RTA kitchen cabinets and bathroom vanities.